As the office environment becomes more reliant on technology and software, the demand for executive assistant (EA) and other office support candidates with high technical competencies is increasing. The role of the modern EA and other office support functions is changing with technology. Companies are seeking out hybrid skillsets, especially for supporting senior level management. While companies know they have this need, the challenge for them becomes objectively measuring technical skillsets to find the right candidate for the job. Generally, companies have a range of requirements for a candidate in terms of technical competencies, depending on the type of business and the industry. Even if a candidate ticks all the boxes when it comes to experience, soft skills, and rapport with the team, if they don’t have the technical expertise, it will be difficult to complete day-to-day responsibilities. The more senior the supporting role is, the higher the expectations, and the more complicated the role can be. As a result, companies require candidates that are extremely organised and well-versed in any IT platform that can help support them. Generally, IT savvy candidates are becoming more common in 2018, a result of the environment in which candidates work and train. However, levels of competency vary greatly. Many candidates with free time or with some allowance from their employers have started to explore taking a few 3-5 day courses to either brush up on their skills or learn new IT skills in order to be more efficient. While these courses require time off from work, and an investment, many candidates are taking advantage of this training, showing initiative, and a desire to constantly upskill. Once you have a shortlist of candidates, and they all cite the same technical competencies on their CV, the question becomes: how can you measure who is most technically fit for the role? One solution is to turn to technical competency testing, a new service that Page Personnel Secretarial and Office Support offers called Skillschecker. This testing helps quantify the technical abilities of candidates, and will help a great deal in the hiring process. By offering Skillschecker to test technical competency, we can provide companies with better clarity on the candidates’ skills and measurable capabilities versus “a gut feeling”. With this information, hiring managers can then make a more educated selection based on test results. 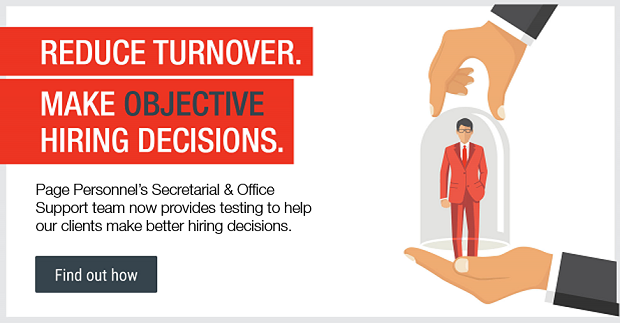 There are a range of tests to take, on a variety of software that are commonly used in office support roles. While any candidate can include “proficient in Microsoft Word” on their CV, it can be hard to decipher exactly what that means. With a skills test, you will know what candidates are proficient in, giving you even more information to ensure you’re making the right decision on who to hire.